Our professionals at Ocean Coast Electric are skilled in a variety of commercial lighting replacement services, as well as commercial electrical installation and maintenance. As a full-service commercial electrical contractor serving Somerset County, New Jersey, and other nearby areas, Ocean Coast Electric is proud to offer honest, friendly, professional services. Continue below for a look at the commercial lighting replacement services and related services that we provide. Lighting Upgrades. By opting for a lighting upgrade, you can save money on your business’s electric bills by installing high-efficiency lights, low-level lighting, or controls that can turn off lights when not in use, such as occupancy sensors or daylight dimming ballasts. Site Lighting Maintenance & Preventative Maintenance Programs. Regular lighting maintenance is critical to a well-functioning commercial operation, ensuring that your commercial lighting is reliable and won’t need expensive repairs due to negligence. In a commercial enterprise, you want to prevent issues before they occur, if possible. Scheduling periodic maintenance checks with Ocean Coast Electric can keep your lighting systems running without any hiccups. LED Retrofits. Having your current fixtures retrofitted with LED lights can help your enterprise consume less energy and give you lighting that is safer, sturdier, and longer-lasting, and are available in a variety of color-temperature values. Emergency Lighting Installations. Accidents happen. If there is ever a power outage due to a storm or another cause, you’ll want automatic backup-lighting in place at your facility. 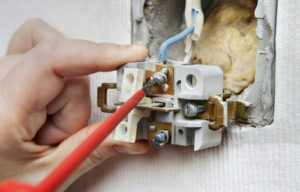 Lighting and Ballast Installations and Repairs. In addition to lighting installations, lighting ballasts also frequently need upkeep. As a device necessary for regulating the current in a fluorescent lighting system, a malfunctioning ballast can cause a light to go out within a matter of seconds, making proper installation by seasoned professionals essential. Outdoor Lighting Repair and Maintenance. Sometimes, problems with outdoor lighting in commercial spaces can be easy to miss, if not entirely forgotten about. If you have outdoor lighting, be sure to contact our team to inspect it. Parking Lot Lighting, Repairs, and New Installations. Installing the appropriate lighting for the parking lot of your business or operation can be vital to the safety and wellbeing of employees and customers alike, not to mention that it can also significantly affect a business’s outward appearance. Sign Maintenance. A damaged or blinking electric sign can negatively impact your space’s appearance. In turn, this can adversely affect the first impression one may have upon visiting your commercial property. If a portion of your outdoor sign needs repairs, Ocean Coast Electric is there to give you a hand with our commercial lighting replacement services. Lighting Design Services and Lighting Energy Management. Our professionals at Ocean Coast Electric can design a lighting system that is best fits your facility, as well as your budget. Ocean Coast Electric proudly serves Somerset County as well as the greater New Jersey community, with a professional team that includes warehouse electricians specializing in industrial electrical services in addition to commercial lighting replacement services. If you would like to learn more about what Ocean Coast Electric can do for your operation, then please contact us today by calling (732) 338-8732 or by emailing us at office@oceancoastelectric.com.